We've all seen posters, logos, and headlines in which the text has a different fill color from its outline or shadow. Surprisingly, this isn’t always accomplished by using your software to stroke and fill the display lettering with different colors—sometimes the font actually includes several separate variations that you can stack and colorize. P22's Zebra is a great example; Adobe's Zebrawood is another. How do these unusual font families work? It's simple: each part is actually a separate font, designed to match up perfectly if you stack two or more text containers on top of each other—some fonts even have three parts, allowing for tri-color text. If you want this sort of look for your brochure, poster, or Web site, here are a couple of ways to accomplish it. If your desktop publishing or word processing application lets you create multiple named layers, create and name a layer. Then, place a text container on that layer and type your text into it. Format the text using one of the fonts, and give it a color. When you're satisfied with how your text looks, duplicate that layer and change the font in the duplicate text box to one of its other variations, and give it a different color. That’s it. You're done. If your application doesn't allow you to create named layers, just copy your text container and paste it on top of itself. If your application has a Paste In Place command (Edit-> Paste In Place), even better—you won't have to reposition the new container to align with the first one! As above, change the font in the second box, and give it a different color. That's all there is to it. In Apple's Pages ( ), you'd copy and paste a text box, and then align it with the original. Fortunately, Pages (and Adobe InDesign [ ]) provide active alignment guides as you drag an item. This makes it easy to snap an item to another item. P22 Zebra is available in several variations: Wedge, LineCut, and Stencil, in addition to the set shown here. The individual fonts are $20, the ABC set is $30, and the family is $60. Adobe's Zebrawood, Pepperwood, and Rosewood (all from the same designers) are available individually for $29, or as a set for $69. Be aware that set prices for fonts can vary. There are scores of other ornamental "fill" fonts available for any kind of project. 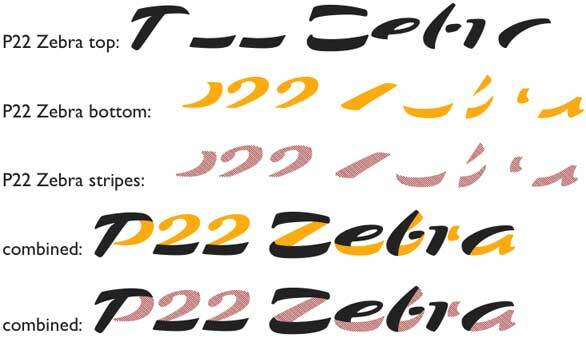 Explore these fonts at Web sites such as P22.com, Fonts.com, MyFonts.com, Comicraft, and Adobe. Try searching for Fill, Handtooled, or Signage.